How to get from where you are to Libby, Montana! Airports, train service, major highways, bus service, and other considerations. Commercial Flights: The nearest commercial airport to Libby is in Kalispell/Glacier Park International Airport which is serviced by Delta, Horizon, United Express, and has charter service and car rentals. Some people book into either Spokane, Washington, or Missoula, Montana, and rent cars and drive to Libby, depending on what flight prices are doing. Rental cars are available at each airport. Open year round, 8:30 AM - 5:30 PM. Libby Auto Sales is located on Highway 2 West, about 2 miles west of downtown Libby. It is on the north side of Highway 2, just past Pamida when you are heading west. They rent cars, trucks, SUV, RV or classic cars by the day, week or month. Timberline Auto Center, Inc. is located just off Highway 2 on Mineral Avenue, downtown Libby. Open year round, Monday - Friday: 8 AM to 5:30 PM; Saturday: 9 AM to 3 PM. There is a public rest area at the Junction of US Hwy 2 and the Bull Lake Rd, just east of Troy with restrooms and picnic tables. 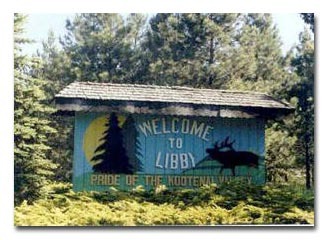 State Highways 37 & 56, and US Hwy 2 all provide access to Libby. During winter months, travel by auto can be quite hazardous across the state because of slick roads and freezing temperatures. Be sure to check road conditions ahead of time, and carry emergency supplies: jumper cables, a shovel, sand or cat litter (for traction), food, water, candles and a sleeping bag for each person in the car. During the winter, travelers can call a toll-free telephone number for a daily updated Montana road condition report, 1-800-226-ROAD (1-800-226-7623) or call (406) 444-6339 for road condition and road construction reports. Weather reports for the Libby area can be obtained from the Kalispell office of the National Weather Service, (406) 755-4829. The new law also requires motorists to operate their vehicles in a careful and prudent manner and at a reduced rate of speed, taking into account the traffic, weather, visibility and road conditions. Laws prohibiting careless or reckless driving also are in effect on Montana roads. These laws allow motorists to be stopped even if they are not exceeding the posted speed limit, if the speed at which they are traveling is considered too fast for conditions or dangerous to others on the road. The careful and prudent provision of the new law requires drivers to adjust their speeds according to the amount and character of traffic, visibility, weather and road conditions. For example, traffic may be heavy or light and may include trucks, cars, motor homes, farm equipment, and motorcycles. In addition, changing weather conditions may affect driver visibility and road conditions. These conditions may include fog or snow and road surface conditions such as water or ice. Drivers should also be aware that wildlife can often be found on Montana roads, usually at the mosts unexpected time in the worst possible place. A black moose is very difficult to see on an unlit back road in the middle of the night when you're going 65 miles an hour. Deer often can be found next to roadways and jump out in front of vehicles. Many of Montana's roads do not have much in the way of shoulder to pull onto in the event of an emergency, so care should be taken in the event you need to get off the road. Log trucks can also be found on many Forest roads and should be given plenty of room. Truckers often broadcast their positions on CB channels to alert other people on the same road of their location. There are 275 RV dump sites located throughout Montana. Some of the sites are free to use, and others are free if products are purchased, you stay at the site, etc. It is advisable to contact the facility ahead of time to be aware of their current use policy. Montana law regulates the storage and disposal of waste materials from recreational vehicles.The law reads: "Liquid wastes from sinks, showers, toilets or baths are not allowed to accumulate on the ground surface. Such waste must be discharged into the sewage system serving the trailer court or campground or into an alternate system approved by the department and local health authority." Waste water (kitchen waste water) must be held in a watertight and sanitary container.The waste water can be dumped ONLY in a designated waste water sump, a flush toilet or a trailer holding tank dump station. Pit toilets and sealed vault toilets are not approved dump sites. Kitchen waste water must not be drained onto ground or into an open container.